Gwen Mwaba, Director, Trade Finance, Afreximbank, and Constant Nzi, Chief Risk Officer, AGF, signing the agreement in Cairo. The African Export-Import Bank (Afreximbank) has signed an agreement with the African Guarantee Fund (AGF) for a $30 million re-guarantee facility to support African small and medium-sized enterprises (SMEs) in the trade value chain to access funds for their activities. 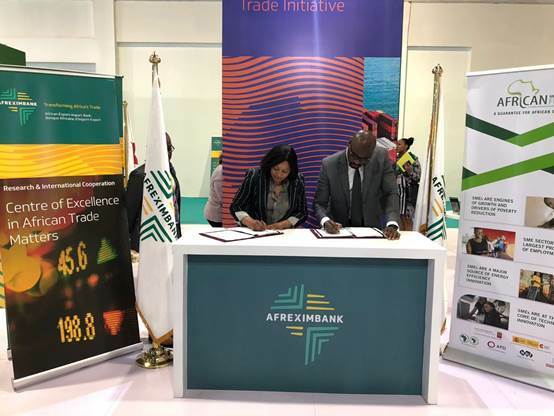 Gwen Mwaba, Director, Trade Finance, signed the agreement on behalf of Afreximbank, while Constant Nzi, Chief Risk Officer of AGF, signed for the Fund, during a ceremony held on the sidelines of the recently-concluded Intra-African Trade Fair in Cairo. The agreement provides for the facility to be used to support the financing needs of African SMEs by enhancing their access to long-term financing, thereby acting as a catalyst to enable them to grow, create more jobs, sustain the existing labour force and develop intra-African and extra-African trade. The re-guarantee facility is aimed at providing comfort to financial institutions in lending to SMEs, which tend to be regarded as a risky segment; enabling the financial institutions to transform their short-term deposits into long-term financing to SMEs; and supporting Afreximbank’s SME support initiative and AGF strategic plan. The facility is expected to support positive social-economic changes among the more than 6,000 SMEs that are expected gain access to guaranteed loans from African local banks, thereby contributing to trade development, economic growth and poverty reduction.